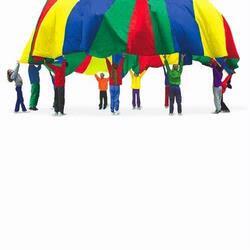 Pacific Play Tents' 35-Foot Parachute with No Handles and with Carry Bag teaches even the wildest group of kids to come together and work as a team. Use this gigantic Playchute with more that 100 different games, and without handles it goes even further towards building and toning upper body strength, including abdominals. Their academic, motor, cognitive, and perceptual skills will also improve. Store and carry it easily in the included mesh bag. Over 100 different games a child can play using these "Playchutes."